What books do we need for a group? Its 1976 and Andy was thinking: “why don’t we ever get any decent girls come to our youth club”. Valerie, who was there that evening, “rather damningly admits” (according to Andy) that she doesn’t remember Andy at all! It was an inauspicious start but the couple was married in April 1983. Valerie: “We found the 10 relational needs in session 3 helpful, as it listed the ‘I need’ statement and then outlined what that looked like in practice; ‘this means…’ This meant we could understand what meeting a need actually looked like in reality and check with each other if we were really doing so. The couple believes in investing regularly in their marriage and has taken part in a few different courses over the years. Apart from spending time together maybe this is the secret to keeping the passion alive? Andy and Valerie live in Thame, Oxfordshire. They have a son and daughter who both live in London. Andy works as a marketing consultant and Valerie as a practice nurse. 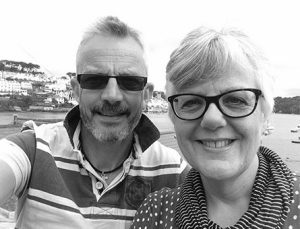 They are also Assistant Pastors at Aylesbury Vineyard church.